Finally getting started on this. 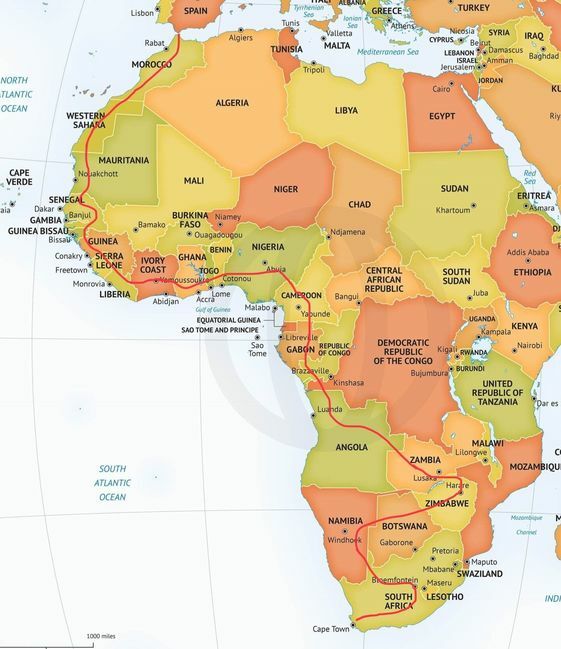 On the 31st October 2019, we will be setting off from Milan and driving overland to Capetown over a period of 6 months. We will be raising a donation for the charity UNICEF as well as raising awareness of the work they do in the remotest parts of the world that is often overlooked or not fully understood. Me and my girlfriend both work for easyJet and they have been kind enough to give us the time off for the trip. easyJet have a long standing partnership with UNICEF, so we are already in contact with top management at the charity and they are fully behind our trip and have offered us their support and contacts throughout Africa. We already have some sponsors involved including easyJet, Britpart and Lazer Lamps. I have spoken to the editor of “The Landy” newspaper and they are going to cover the 6 months of our trip in 6 or 7 of their monthly publications. We really hope to have a page in the easyJet onboard magazine at the end of our trip in April/May 2020 with a potential audience of 220k people per day. We will be covering the journey on our successful instagram page (www.instagram.com/defender.adventure) and running an online blog that we will be launching in the coming weeks. I have also put out some feelers to the popular Land Rover magazines so I hope maybe we will have something there as well. So this is where we are so far, we have a good plan of our route and the planning is going well. Wow, That is some trip and for a good cause. As we will be taking the 90, we have decided to convert a Sankey Wide Track MK3 to a overland trailer to make the trip more comfortable. We already have a design in mind and will be starting the build in the next few days. 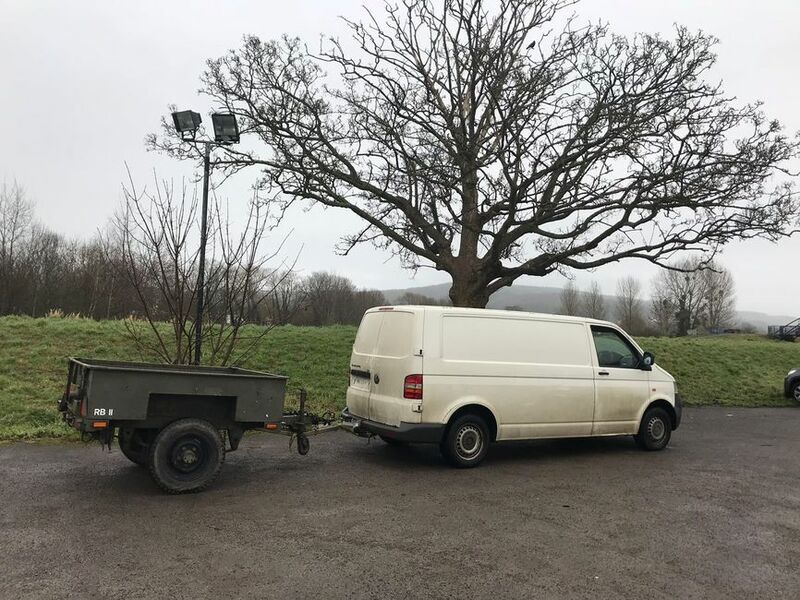 We are going to slightly extend the front of the trailer to help with balance as it’s a bit sensitive to loading at the moment. The total trailer chassis length will be 335cm, this means we have no trouble fitting everything in the shipping container at the end of the trip. The spare wheel on the rear might join the one on the front, but this depends on final nose weight. 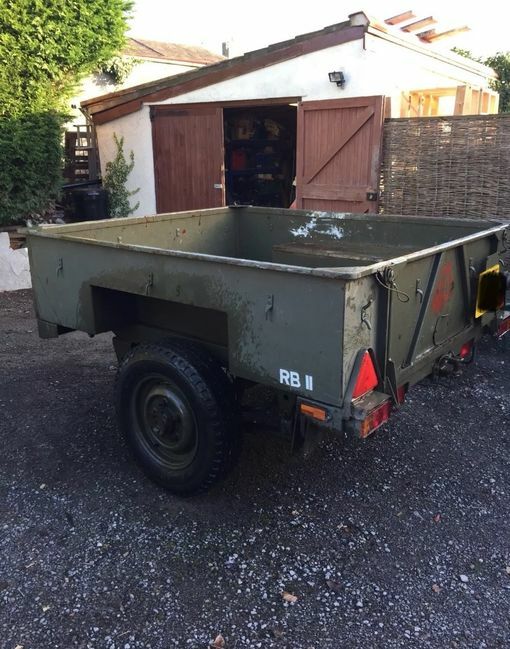 - Spare wheel and battery box will be located at the front of the trailer. - The first large door will contain the pull out kitchen and Food storage. Will be using the SMEV 9722. - The small door above is for storing the chairs, fishing rod and anything else that needs a long space. - The next door in the centre will have a pull out shelf holding 4 Wolf storage boxes and camp table. - Below this door between the wheel arches will be the water tank. 80-100l (directly over the axel so balance is maintained what ever the level of the tank. - Between the chassis legs below the water tank will be the extra fuel tank. 60l (This will give us 1000km range) about 1/2 of this tank will sit in front of the axel, but due to its low posistion level shouldn’t effect balance to much. - The large door on the right of the trailer will be the main storage area, clothes, a few spare parts recovery equipment etc. - Below this area will be the air tank for the onboard compressor. - The spare wheel in the rear can be moved to the front as stated above, but this will depend how we go with the nose weight. - Lastly, the tent will sit slightly forward on the top of the trailer. I’m sure the design will have some modifications as we go along, but at least we have some ideas down on paper so we have something to follow for now. Sounds like an amazing adventure for a great charity. Will done and I'll be watching this space/Instagram regularly. Have been to a range of places in West Africa through work and the people/place is amazing. However some of it is not. Just do your homework, enjoy, be careful and good luck. Having finally succumbed to Instagram I will be following with much interest! Looks like an amazing trip! Do you have plans beyond Cape Town? Return UK? We actually live in Italy, so from Cape Town the car and trailer will go into a container and come back to Europe. 6-8 weeks and it should be back with us. We haven’t chosen a port yet as we are super flexible. Wow what an amazing trip and an experience of a lifetime, looking forward to following your journey with envy Being a sewage diver at least I know how deep the 💩 will be at work today. I will use this thread as the build thread and I will write up what I can. As for the gas bottle, there will be a door on the opposite side of the kitchen where the gas bottle will be accessible. This way, it can stay put as the kitchen slides in and out. Having it located here will mean It’s also out of the sun and any potential damage. Every door will have a paddle lock to keep out unwanted guests, however we will be with the trailer and car most of the time to keep an eye on things. But at night it will be nice to know everything is locked up at least. The trailer is securely attached to the car when ever the rear door is closed. The location of the spare wheel stops the nato from being opened. Which is a pain sometimes but it’s a sort of built in security device. Of course if needed the spare can be taken off and the trailer unhitched without opening the rear door. Keeping dust out.... I hope to use T section aluminium that will slot between the marine ply and the steel frame with a rubber seal on either side of the T if you see what I mean. The fridge will stay in the car and the idea is we will carry just the fridge and the tool box in the car to keep weight down. 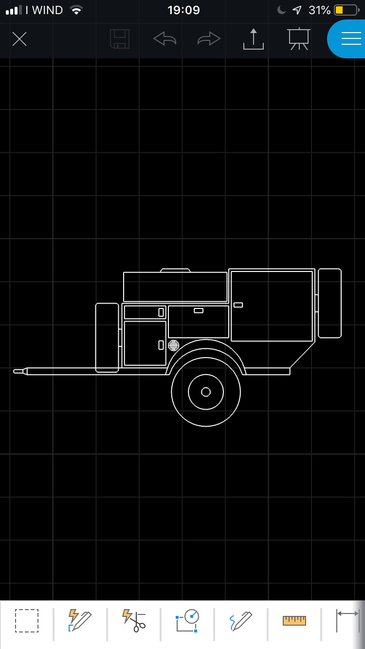 Trailer suspension is simpler to fix that the Defender. We will take mounts for the tent to go on the roof of the Defender for a worst case scenario that we have to ditch the trailer for some reason. I will load up the first pictures in the next day or so. The trailer should be going to the fabricators on Thursday morning for the extension to the chassis, once this is done, I can finally start to crack on with the build. It came from a guy in Bristol, UK. My mate was working close by so he picked it up for me and took it to RAF Brize Norton for safe keeping untill I had sorted out how I was going to get it to Italy. The trailer sat at Brize Norton for about 5 months. 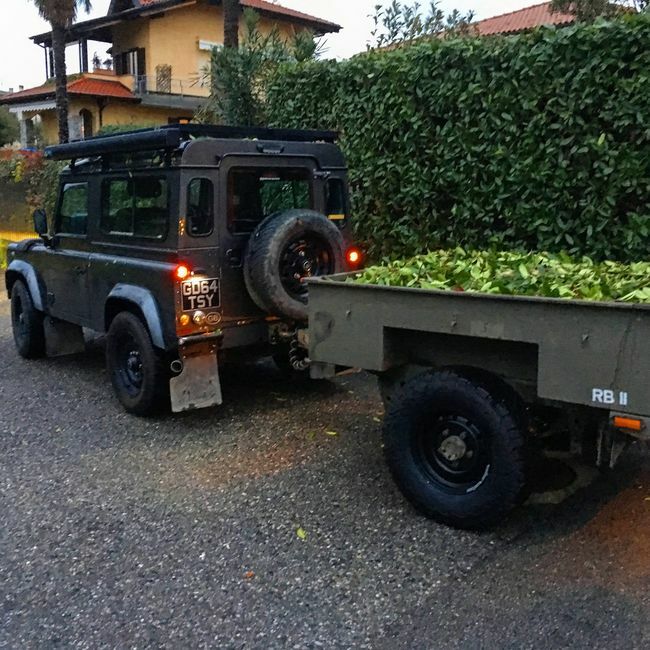 I put a few posts on different forums asking if anyone would be traveling from the UK to Italy and would mind towing it down for me. I had a few replies right away and after about 3 weeks the trailer had been picked up and was on its way. So I finally finished the jobs that I needed it for and removed the tub, I am now left with a blank canvas to start the project. 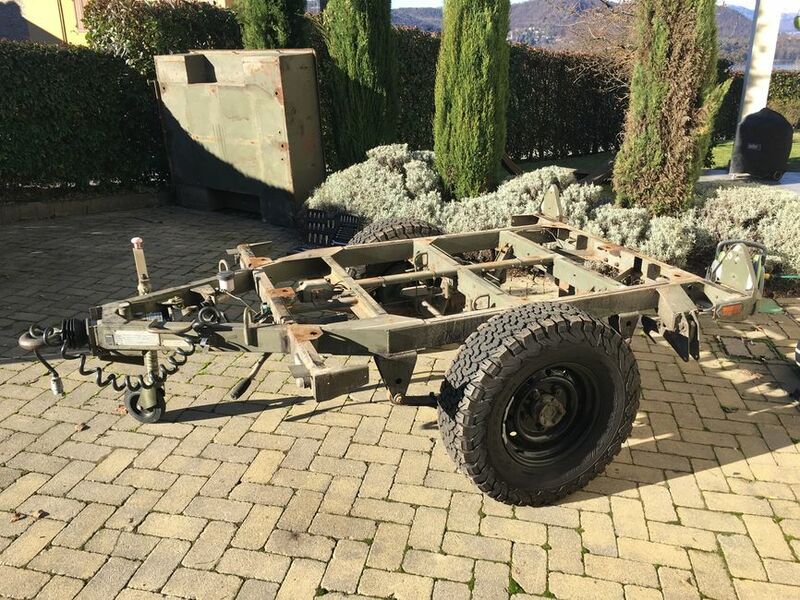 Having not seen the trailer when I brought it, I have to say I think was lucky and I got a good one, the chassis is in great condition, brakes work well and there are no bits missing. The tub has a bit of surface rust and could do with a paint, but as I won’t be using it, it doesnt really matter. WOW what a great cause and journey and the best of luck getting all this work sorted out before you go and i will be watching with interest on D2N as i don't do any others 1996 Golf Blue 300Tdi 110 Pick up. Keeper.